Wichita, Kan. – If you will be hosting your family or friends in Wichita during the upcoming holidays, Visit Wichita can help you make it a visit they won’t forget. Show your guests why Livability.com named Wichita a “Top 10 Surprising Foodie City” by taking them out to a few of the 1,000 restaurants in Wichita that reflect our city’s appetite for brunch, lip-smacking barbecue, international cuisine, delicious steaks and more in settings ranging from fine dining to family-owned, independent fast food restaurants. Don’t forget to show off the growing number of craft breweries Wichita has or stop for a specialty drink at one of the many local coffeehouses. And if you need snacks or desserts, your guests will love sampling at Nifty Nut House, selecting a handcrafted chocolate to savor in the chocolate lounge at Cocoa Dolce or stopping at other one-of-a-kind sweet spots like Churn & Burn or College Hill Creamery. You’ll have no problem keeping your visitors busy during their stay in Wichita. 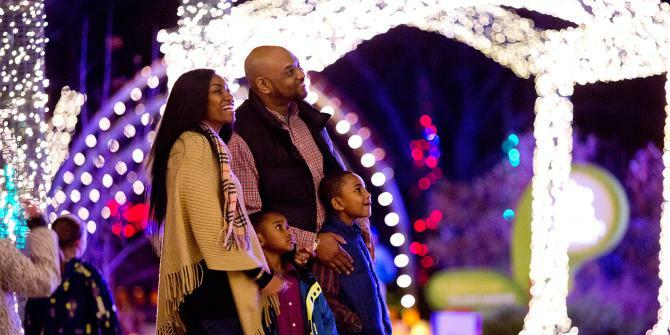 For a helpful recap of the array of holiday festivities taking place, VisitWichita.com has blog posts on holiday activities that started in November and more festivities that are set to start in December. You can also search the website’s calendar of events or scroll through sample Wichita itineraries for suggestions on where to go and what to do. The same resources are available through the Visit Wichita app, which allows you to make and save plans in advance or will guide you in the moment with interactive features. The free app is downloadable for Apple or Android smartphones and tablets. Visitors to Bradley Fair can enjoy a horse-drawn carriage ride through miles of crystal lights throughout Bradley Fair. Carriage rides are available through Dec. 23, from 6 to 10 p.m.
Another attraction your guests really shouldn’t miss is seeing the Keeper of the Plains. The nightly lighting ceremony is at 7 p.m. The plaza around the statue is being renovated, but the Keeper will remain visible throughout the work, however, there will be times when sections of the site will be temporarily cordoned off and inaccessible. Don’t forget the discounts available at 11 Wichita-area attractions through the Explore Card. Guests pay full admission for each ticket at the first attraction they visit, then they are eligible to receive a $2 discount for each ticket purchased at the other participating attractions through Dec. 31, 2016. The card is free and available at the attractions (except the Kansas Aviation Museum) or at Visit Wichita’s office, 515 S. Main, from 8 a.m. to 5 p.m. Monday through Friday. Explore Card participants: Botanica, Exploration Place, The Kansas African American Museum, Kansas Aviation Museum, Mid-America All-Indian Center, Museum of World Treasures, Old Cowtown Museum, Sedgwick County Zoo, Tanganyika Wildlife Park, Wichita Art Museum and Wichita-Sedgwick County Historical Museum. Another easy way to save a few dollars is to peruse the Visit Wichita Deals &apos;n Discounts. Trivago rates Wichita third on its list of best value cities in the U.S. in 2016 based on the annual average price of a standard double room and the city’s average hotel rating. With more than 8,000 rooms, there are plenty of options for places to stay in Wichita. If your guests opt to stay at a hotel during their visit, Wichita has a wide variety to choose from, including economical motels, luxurious full-service hotels, extended stay properties and spacious family-friendly suites.